The Toyota comeback rolls on as the Japanese automaker takes aim at Detroit. The recovery of Toyota from its recall crisis, Japan's earthquake and tsunami, and the strong yen has been well documented by now, but there has been less speculation about the consequences for the competition. It is becoming clear that one of the first casualties will be Ford Motor Co. Toyota has long been the single most popular car brand, outpacing both Ford and Chevrolet. But soon, several experts say, all Toyota vehicles -- including Scion and Lexus -- will surpass Ford Motor's Ford and Lincoln brands and move into second place in U.S. sales after General Motors. 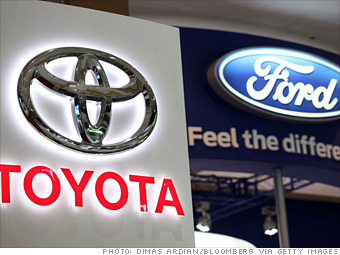 "We see Toyota Corp. overtaking Ford Motor Co. this year," says veteran analyst Tom Libby of R.L. Polk. There's a perfectly good reason why the world buys cars from Germany. No one else quite measures up.